Finally, the photo club had arranged for us to take pictures inside the beautiful Our Lady of Victory Basilica. I was so excited! In my nearly 50 years, I had never once even peeked in through the doorway. Photo by Steven Vacher; ISO 100, 15-second exposure. Once inside, I understood why documentaries had been made about this grand church. It was so ornate. Michelangelo could have painted these ceilings. Still, after more than 100 years, the colors were so bold and beautiful they could have been painted yesterday. The marble and gold glistened in the sunbeams. One big problem, though. It was so dark inside. How was I going to photograph here? The ceilings were much too distant to be affected by flash. That would ruin the delicate colors as well. This problem was compounded by the brightness of the stained glass windows. Sure you could see. But how about the camera? Fortunately, one of the seasoned photographers in our group was kind enough to offer some tips. 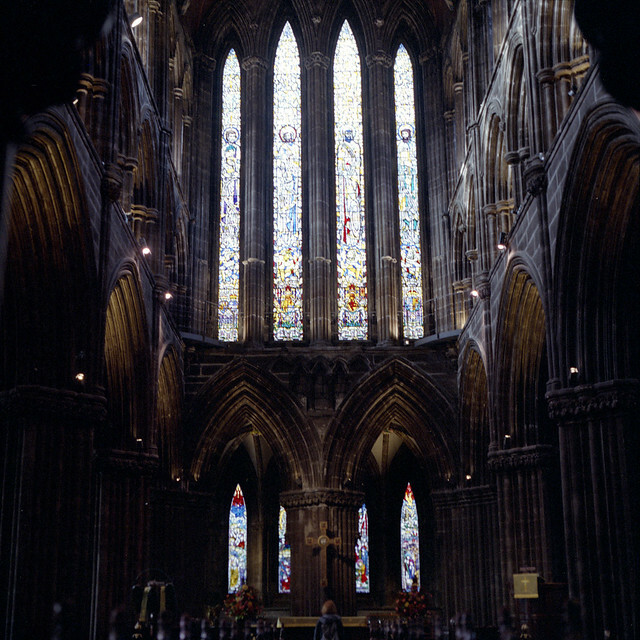 Without using HDR or other multiple exposure techniques, you cannot properly expose both the windows and the room. Choose one or the other. The windows are easy because they are so bright. You have full choice of aperture, shutter speed, or ISO. Just know that when you expose properly for the windows everything else will look nearly black. If you choose to expose for the room, the windows will be blown out (way too bright).You will want a fairly small aperture to keep everything in focus, f/8 or smaller (bigger number). If you don’t want grainy photos, you’ll have to keep your ISO as low as possible: 100, 200, no more than 400. That means you’ll have to settle for a slow shutter speed, ½ second, maybe 1 or 2 seconds. You really need a tripod to hold the camera steady at those speeds. But if you’re caught without one, a bit of clever snooping will let you find solid surfaces upon which to brace your camera. A bit of pressure against a post, a pew top, pew sides, or the floor will at least let you get some photos. Also, you can use your camera’s self-timer to avoid shake from your hands. Frame your shot, set the timer and put the camera down. The slow shutter speed trick worked miracles! I came home that day with tons of great shots from inside this beautiful church. Memories to last a lifetime. Next time you’re confronted with a dark space that cries out for photos, remember this slow shutter speed trick. You’ll be amazed at the images you can create where once before you imagined there was not enough light.